This project was completed both as as a submission to the 2011 CHI student competition by a team comprised of Jeff Wain, Austin Toombs, Kevin Warlorski, and myself. It leverages the social aspects of food consumption along with social networking to help people to get to know others in their neighborhood. Our design consisted of a web-based interface that allowed users to connect with each other and track the different experiences that they had. Users are presented with two maps: a local map and a world map. 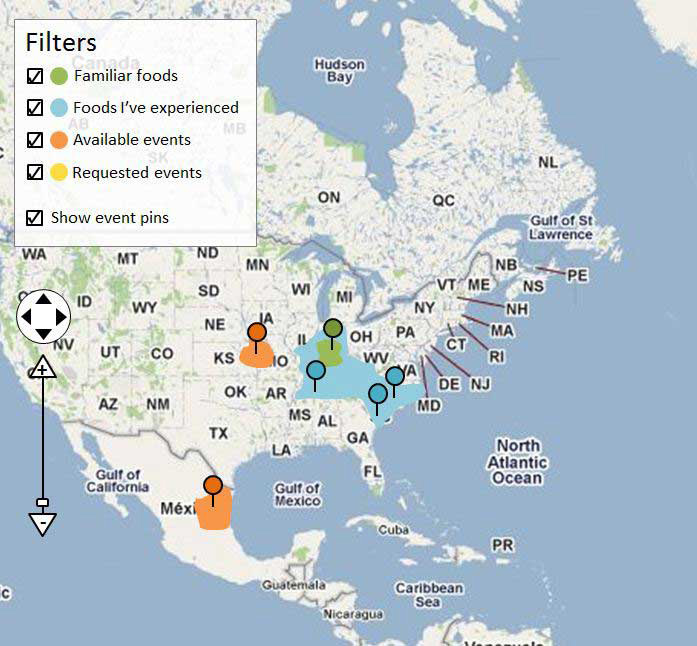 The local map presents the user with a view of other members of the community that are in their vicinity, and displays upcoming events as well as events that have been attended. Attended events add to a heat-map style visualization of the different parts of the local community that have been experienced. The world map displays the different culinary experiences that have been had, referencing them to different geographical areas. 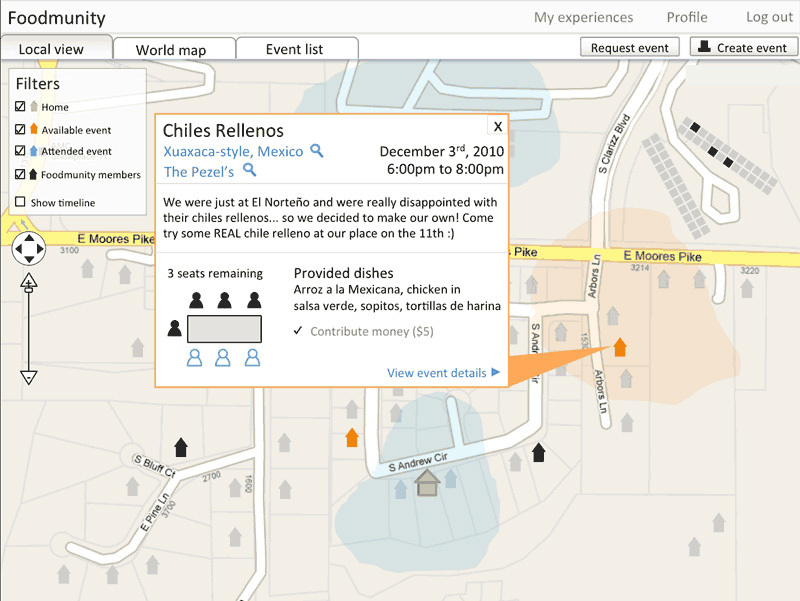 By displaying events in this way, we hope to make users aware of how much more can be done, and motivate them to do so. The two maps give a visual representation of new experiences that can be had. The events themselves are based around themes: a way for the users to further express themselves. Ultimately, the goal is to allow people the ability to organize events that create a comfortable way to gather, learn more about the other people in their local area, and how that relates to the bigger picture of the world. Beginning with the CHI prompt of encouraging diversity, we began by defining what definition of diversity we wanted to engage in our design as well as how to approach it. Through a process of research and affinity diagramming, we arrived at food as both an embodiment of diversity and a means of bringing people together. Taking this as a starting point we individually created a large number of possible systems that could support the use of food to address the issues surrounding diversity. 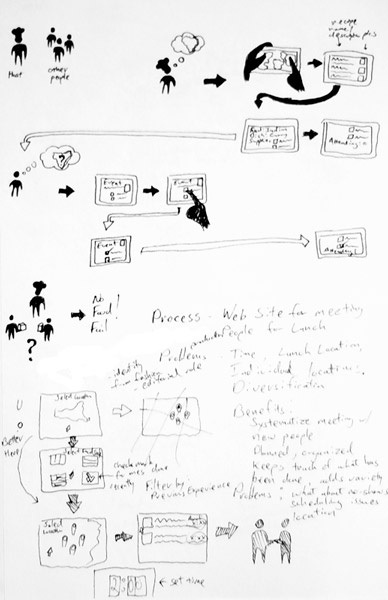 Through combination of critique and synthesis, the core elements of the concept were generated. The design was presented at CHI 2011 where we made it to the finals and, ultimately, took second place in the student design competition.